The Machane Yehuda market, also called the shuk, is one of the most beautiful markets and familiar icons in Israel. The market it located in Jerusalem, the capital of Israel, and its character adds to the city’s unique flavor. In Machane Yehuda you can find everything, ranging from clothes to housewares; flowers, art, accessories; and every variety of fresh and specialty food: sweets, baked goods, meat, fish, eggs, produce, spices, dairy products and so much more. The shuk is also a great venue for Jerusalem’s night life, with restaurants, bars and intimate music clubs. The market dates back to the Ottoman period. An empty lot as the 19th century drew to a close, it was developed by local peasants who brought produce to sell in this central location. Slowly the open grounds were turned into an organized market. The success of the shuk was attributed to its location, which was a much closer walk to neighborhoods and villages located outside of Jerusalem’s older and more established Old City. The Ottoman rulers did not have a particular interest in the market, however, and did not develop any infrastructure for it, such as drainage ditches or stalls for the sellers. The peasants and Arabs who set up shop in the shuk took it upon themselves to build their own shops and storage facilities. A significant difference in the outer appearance of the market began to develop during the Mandate Period (1917-1948). The first governor of Jerusalem (Ronald Stores) saw how important the shuk was to Jerusalem’s unique atmosphere. Stores also wanted to encourage the citizens of Jerusalem to support themselves financially; he couldn't bear the sight of the shuk, and so he appointed a city planner, Charles Robert Ashby, and an architect to create a formal design for the market. Ashby’s plan included desperately needed infrastructure, such as proper sewage and garbage disposal, lighting, and running water. Ashby planned a large market, surrounded by a walls on each side. He proposed Oriental-style gates, with arched domes, which matched well with other Mandate Period designs. Despite his great efforts, Ashby's design was not executed (mainly because of budget restrictions ), and the market continued to maintain its ramshackle appearance. 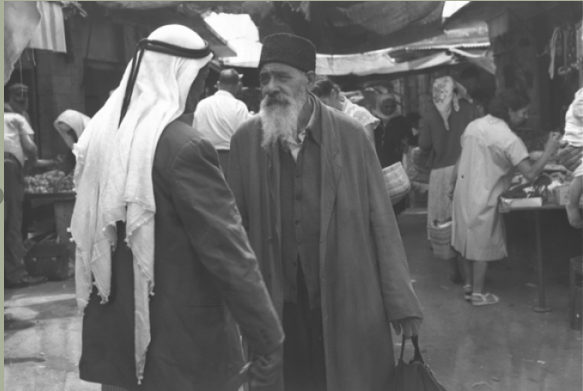 Over time, larger crowds began to attend the shuk. The merchants began to change (a certain percentage of the Arab merchants sold space to new Jewish immigrants). At that time, the Etz Chaim Yeshiva showed a spirit of initiative. Located in the midst of the market, the yeshiva established a row of shops alongside the wall, collected the rent from the merchants, and by doing so managed to increase the income of the yeshiva. The First Market - HaTapuach St. and HaAgas St. The Second Permanent Market: "Loan and Save"
About a year after the new market was built, about 20 merchants and stand owners decided to go to the city committee for financial help to allow them to build their own permanent shops. The traders of the "loan and save" market where extremely apprehensive about their livelihood, and therefore they were against these demands. Nevertheless, a portion of land was acquired, west of the first market, and in 1931 a new and additional market was launched. Many of these merchants were immigrants from Iraq—and this area is still know as the Iraqi market. Over the years, the Machane Yehuda market continued to develop. andToday it covers a large territory, stretching from the Etz Chaim Yeshiva to the Bet Yaakov and from Jaffa Street to Agrippas Street. Over time there have been many projects and initiatives to benefit of the market. Today it is an extremely successful place that manages to remain authentic, blending the old-fashioned with the cutting-edge. The market is now overseen by Machane Yehuda Management, with representation from appointed merchants. The management team is in charge of the market's business development and is in constant dialogue with Jerusalem’s city hall, the Ministry of Health and other government entities.